This is Part 7 of a multi-part series from my recent trip to Orlando & Clermont, Florida. Part 1 was with Dennis Mitchell and Part 2 was with Brooks Johnson. Parts 3 & 5 was Hurdle Touchdown Times with Kellie Wells Training and Part 4 included Håkan Andersson. Part 5 was myself being interviewed by Derek Hansen. The Oscar Pistorius story isn’t the only headline in attempting to compete at both this year’s Olympic and Paralympic Games in London. 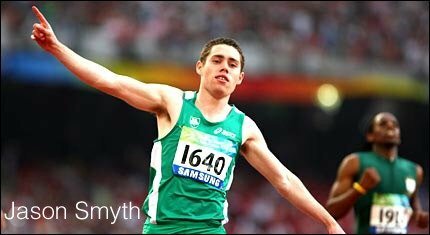 Northern Ireland’s Jason Smyth has his vision affected by a condition known as Stargardt’s Disease. He won two gold medals at the 2008 Paralympics in Beijing, and became the first Paralympic athlete ever to compete at the (able bodied) European Championships in 2010. 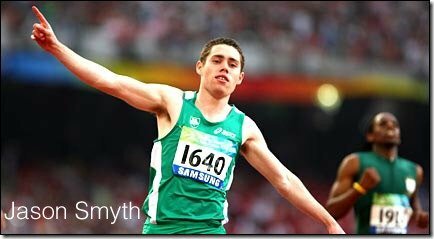 The 100 meter Olympic “A” standard is 10.18 and Smith ran 10.22 in 2011, just missing it by an agonizing 0.04 seconds. 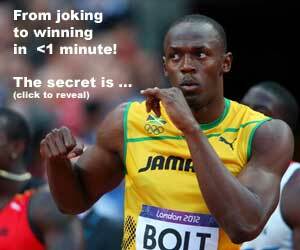 The good news is his 2012 opener was a 10.24 performance, the fastest ever as an opener. There are no controversies here with devices assisting in a better performance. He is legally blind. I had the chance to shadow a full workout with both Maguire and Brauman, and afterwards, I interviewed him with some coaching questions. In this interview, we actually get a good insight on some of the magic workouts and distances that both coaches use. In the last part of the interview, he talks about using Freelap and how it helps.